Scoliosis Exercise to Help Straighten Your Spine! Specific scoliosis exercise should focus on the length tension imbalances in the spine. Scoliosis is a lateral curvature of the spine with rotation of the vertebrae. On the side with the convexity the muscles are long and weak because they are overstretched. On the side of the concavity the muscles are short and tight as they are bunched up and caved in. Persons who have scoliosis can benefit from increasing their core stability and trunk strength. You can do this very effectively using the Pilates Method and other core strength techniques. I am demonstrating some of these core strength and stability exercise for people with scoliosis on the foam roller in the video below. Any of the unilateral movements where you are lifting one arm or leg are great ways to do scoliosis exercise and also helpful in strengthening and stretching the scoliotic spine. Scoliosis is more common in the upper back or thoracic spine where there is a "C" shaped and sometimes, in unusual cases an "S" shape, which actually pulls it somewhat back into shape. Find out more ways to do exercises for the "S" and "C" curves in your spine here. Or...Maybe you have a bit of kyphosis in the thoracic spine or upper back. Find out more about kyphosis and how to help it with exercise here. This Pilates exercise can be done standing or sitting in a chair or, see several ways to stretch for scoliosis here on an exercise ball. If you hold a weight in the hand reaching to the floor the stretch will be more intense. The stretch should be away from the side with the concavity to stretch the tight muscles where the "C" is hollowed out. It will feel very tight. Several repetitions of this stretch should gradually allow the muscles to release. Try this and some of the many other exercises in the Pilates ebook available here as effective scoliosis exercise. Breathing exercises are good for people with scoliosis due to the tightness in the muscles of the upper back. A deep breath helps to stretch and open up the ribcage and vertebra. You can find some ways to do abdominal breathing exercise in this article. The best and most effective way to work on your length tension imbalances, I believe, is with Pilates based techniques for scoliosis exercise. Pilates exercises help to effectively realign the spine by changing the length tension imbalances in the muscles. Using the Pilates Equipment(Wunda Chair), shown here, effectively uses spring tension to stretch and strengthen the tight and weak muscles. 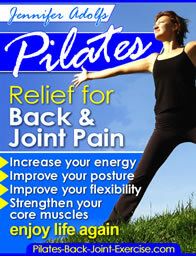 See more information about how to stretch and use the Pilates chair from this page.